The story of Litronix and its calculators has parallels with Bowmar. Litronix was also a manufacturer of LED displays which diversified into the manufacture of electronic hand-held calculators in the early and mid- 1970s. It was a major supplier in the calculator market and produced a range of well specified and stylish models, with later models being assembled in Malaysia. 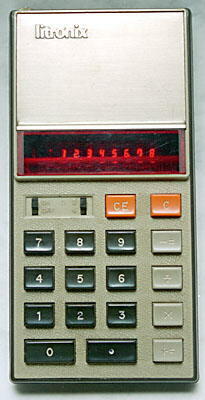 Like Bowmar it was badly hit by the plunging price of calculators in the mid-1970s and left the calculator market. It was bought by Siemens A.G. of Germany. Probably the first Litronix model, from around 1973, with fixed decimal point, switchable between 2 and 4 places of decimals. This is one of the featured hand-held calculators on this site. 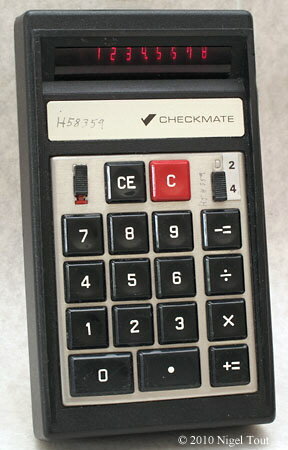 Another early Litronix models with fixed decimal point, switchable between 2 and 4 places of decimals, from about 1973. 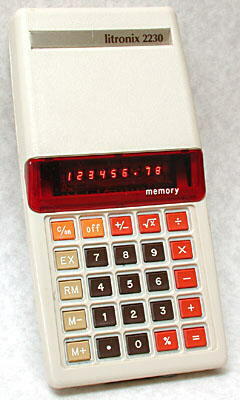 Typical of the later well specified and stylish Litronix models with memory and square root, dating from about 1975. For further photographs of Litronix calculators see the Calculator Photo Library on this site.